One of the great things about inviting blog guests who have experience talking to kids, is that they tend to explain things well. Margo L. Dill is one such author, who gives us a clear and candid peek into her process of coming up with a topic for her middle-grade historical novel, Finding My Place. When deciding to write a historical fiction novel for 9 to 12 year olds set during the Civil War, I had to do some serious digging for a potato idea. I wanted to write historical fiction that teachers and home school parents could use with children—these were the books I liked to use with students when I taught fourth and fifth grade. But do you know how many Civil War books there are for this age group? Too many to count. Then I read a tiny paragraph in a fifth-grade social studies book about some citizens in Vicksburg, Mississippi who did not want the Yankee army to capture their city, and so they were under siege for 47 days. They lived in caves and even ate rats to survive. What determination! The potato was starting to grow in my mind—although it was still just a baby red. After reading and researching Civil War books for this age group, I realized many are set in the North or told from the point of view of a Yankee soldier. The children are usually drummers in the army or pretending to be older so they can be a soldier—and most are boys. So, what could I do to really change things up? I could create a female main character and make her Southern. And she would have nothing to do with fighting in the army—she’s a citizen, trying to survive a 47-day siege. Okay, now the potato was starting to get big enough to bake and serve with a ribeye steak. But I still wasn’t ready to write. Historical writers have to do research, of course—and primary sources and visiting the place (even if it’s virtually) of your setting are essential. I was lucky to find a book STILL published, written by a woman who lived during the siege! I also visited Vicksburg (three days after the 9/11 attacks, but that’s another story) and saw the Mississippi River and its banks, the battlefield (now a national park), museums, library vertical files, and homes with damage and even an unexploded cannonball! I talked to experts on the siege; and finally, I came up with the idea for my book: Anna Green has two siblings—her mom dies during a bombing and her dad is fighting for the Confederate Army. So now she is the head of the household. What will she do? Will she be able to take care of her siblings in a cave for 47 days? Will she allow her pushy, bossy neighbor, Mrs. Franklin, to take over? Will her brother and father come home? Once I had a potato idea AND enough research to back me up, writing the book became much easier—although it’s still one of the hardest things I’ve ever done. I think sometimes as writers we are stuck when we don’t have our idea fully formed, and we need to give it some time to grow while we dig a little deeper. Learn more about Margo L. Dill on her website. 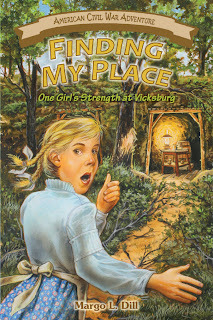 Until April 1, 2013, you can buy Finding My Place at a sale price here. After April 1, you can purchase the book from Margo's website, Amazon, and Left Bank Books. I'm thrilled to welcome back picture book author Claudine Gueh Yanting. 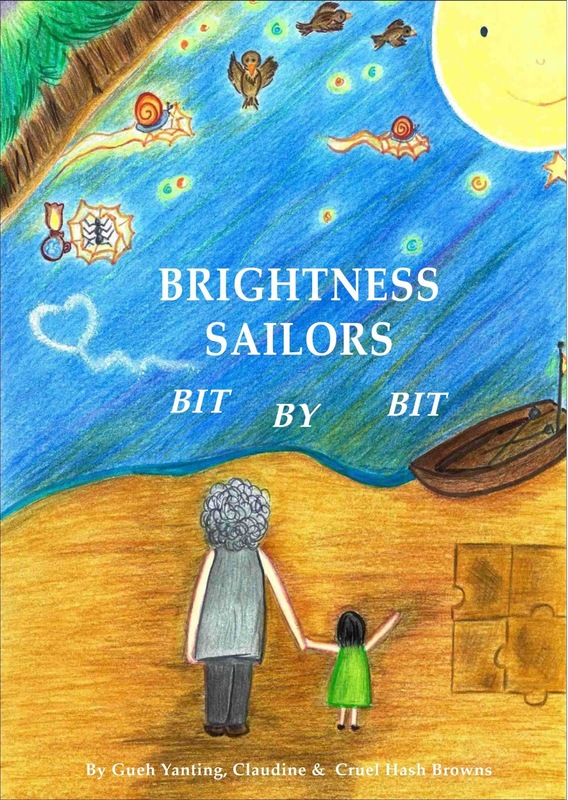 Her latest book, Brightness Sailors, Bit by Bit, is a bittersweet poetic text about a girl trying to keep her grandmother from drifting away from the real world and memory. Claudine talks here about getting to know her main character. 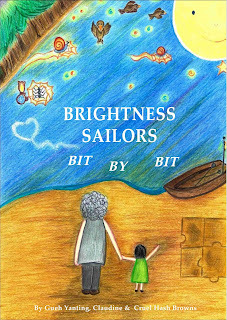 En, my main character in BRIGHTNESS SAILORS, BIT BY BIT, was a seven-year-old who sailed out to relight her grandma’s dark and troubled stream of thoughts. En pushed the boat out alone, her determination as clear as the sky was black. And off she went, my little heroine. Who wasn’t a watcher but a doer. Who did not sit and cry when sad things happened, but went out and made things brighter. En was so different from my real seven-year-old self (I was more Ramona-on-her-sulky-days) I was worried I might not know her deeply enough. Like every writer then, I carried out imaginary conversations to seek more answers. Don’t make her out to be Super Girl 99. She’s only seven, and she’s losing her closest family. Do you not think she’s terrified? I’m scared. It’s so dark. But then I try not to think about it. Finding Grandma is more important. The waves are sneaking higher, b…but I’ll try to ignore them. Reaching Grandma is more important. Loving Grandma is more important. I’ll try and try and try to help her remember. Trying and doing – that was En’s way of coping. She sailed out alone. She released Brightness from a sack. She rowed on when the waves grew harsher, letting her insecurities show bit by bit through her environment and not through her. She stayed strong, as advised by the spiders in the sky. She smiled despite the wreck. Who knew seven-year-old protagonists could be this cool? En was afraid, but she didn’t show it much or stray because of it. I’m very proud of her, my little heroine. I hope her Brightness reaches you. Learn more about the book and about Claudine Gueh Yanting at CarryUsOffBooks and Goodreads. To celebrate its release, Claudine has a gift for everyone called ‘A Little Book of Brightness.’ Please remember to check it out. Thanks for reading! There can't be much in life harder than watching your child battle a serious illness. But if you're a writer, you have a chance to use that experience to help others. 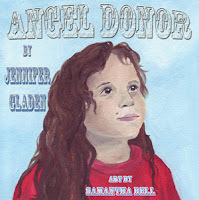 Jennifer Gladen is one such remarkable parent, whose book Angel Donor, was inspired by her own daughter's need for a liver transplant. Here Jennifer discusses how she approached writing about such a difficult topic for children. When I started writing Angel Donor, I was nervous. How could I write such an important story aimed toward children and not frighten them? Angel Donor is a story about Olivia, a little girl in need of a liver transplant. It follows Olivia through the day she gets a call that her doctors have a new liver for her. This is certainly a topic which could easily overwhelm and frighten children. However, the goal of the book was to be a book children in the same situation could identify with. I knew the book needed to be informative and comforting. When writing children’s books about serious topics, it is important to be honest and educational. I thought about the basic things a child goes through when they are preparing for a transplant. I wanted children to say as they are reading the story, “Oh yes, I felt that way.” Or “I had to get an IV too!” It was important that children who are going through the same things feel validated when reading the book. My hope is that Olivia, the main character in the story, is someone who “gets it” for the readers. Although honesty is important in the story, I also made sure there was a balance. Simple things can be frightening to children, so it is important to choose the text and descriptions carefully. It is a tricky performance to be able to show the readers what Olivia experienced, yet not be too frightening. Why write a book about such a serious topic? The idea came to me when my own daughter, Jacqueline needed a liver transplant at age 4. Many times, I longed for a book I could read to her about the hospital, liver disease, or transplantation. As a teacher, my training told me the best way to prepare a child for life experiences is to read and learn about them. This time, however, I could not find a book to prepare her. “There should be a children’s book about this,” I said to myself. And there, the idea for Angel Donor was born. It took years to put it together. I worried I wouldn’t do the story justice. What if I left something out? What if it was too scary? As any writer will tell you, sometimes you have to silence that inner editor and “just sit and write”. But I didn’t just write off the top of my head. I interviewed other parents of children with liver disease and asked them what they would like to see in the book. I ran the manuscript by doctors, nurses and social workers. Each bit of research helped shape the book and kept the focus on helping children as they watched Olivia get her liver. Learn more about Jennifer Gladen at her website. Purchase Angel Donor from the publisher, at Amazon, or at Barnes&Noble. I'm pleased to welcome Barbara Kyle, the author of five novels set in Tudor England, including The Queen's Gamble, an "Editor's Choice" of the Historical Novel Society. Her latest release is Blood Between Queens (May 2013). Barbara shares her perspective on choosing a good setting for historical fiction. Game changer. Turning point. We use these terms to describe crucial, pivotal events. In my historical novels I like to call such events the hinges of history. It's a powerful image: a swinging door. An opening, a closing. Sometimes with a joyful whoosh, sometimes an anxious creak, sometimes a furious slam! I set my stories at these hinges of history – decisive historical events – to test my characters’ mettle as the doors of change open and close. My “Thornleigh” books follow a rising, middle-class family through three tumultuous Tudor reigns during which they must make hard choices about loyalty, allegiance, duty, love, and family. The Thornleigh family is fictional; I created them. But the historical events they're passionately involved in are dynamic hard facts. The "Thornleigh" series begins with The Queen’s Lady set in the nerve-jangled court of Henry VIII as he wrenches England away from the Roman Catholic church to divorce Catherine of Aragon and marry Anne Boleyn. To get Anne, Henry created a national church, and any subject who refused to acknowledge him as its head was threatened with death. Honor Thornleigh fights to save victims of the religious frenzy of the day, and risks her life in trying to save her guardian, Sir Thomas More, from the king's murderous wrath. In The Queen’s Captive the hinge of history swings when Henry's daughter, Queen Mary, imprisons her twenty-year-old half-sister Elizabeth in the Tower. The terrified Elizabeth fully expected to be executed. The Thornleighs make it their mission to save her, and in the ensuing national uprising against Mary, Elizabeth learns the hard lessons she will need to become a formidable leader. The Queen’s Gamble is set during the young Queen Elizabeth's fledging reign when she faced enemies on all sides. Fearing invasion by the French through Scotland, she sent money to John Knox's Scottish rebels who were fighting their French overlords. Isabel Thornleigh accepts the dangerous mission to secretly take the queen's money to Knox. Eventually, Elizabeth gambled by sending an army north to face the mighty French. Her victory over them, ushering in Knox's Protestant government, swung a hinge of history that forever changed Scotland. 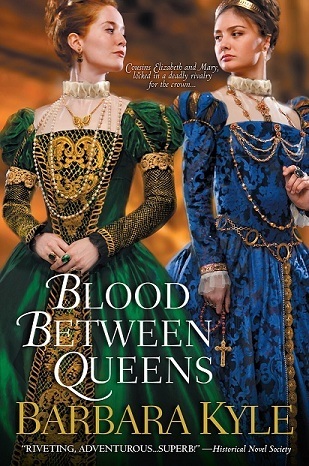 My new release Blood Between Queens again features Elizabeth I, and the hinge of history is the emergency that Mary, Queen of Scots, creates when she flees to England to escape her enemies and throws herself on the mercy of her cousin Elizabeth. Mary, though, has set her sights on the English crown, and Elizabeth enlists her most trusted subjects, the Thornleighs, to protect it. But Justine, the Thornleighs' ward, pities and sympathizes with Mary when Elizabeth holds her royal cousin under house arrest and launches an inquiry into the accusations that Mary murdered her husband. The crisis splits the Thornleigh family apart. The hinges of history tested the people who lived in those turbulent times. To this day we can hear echoes of the doors swinging open . . . and those slamming shut. Learn more about Barbara Kyle at her website. Purchase Blood Between Queens at Amazon and Indigo.